As springtime buds appear, we are invited to tend the growth of our spirits. How can we cultivate gratitude? Living a Life of Gratitude: The praises and petitions of our lives rise and fall with the tides of “good” news and “bad” news. How do we anchor the highs and bolster the lows in order to find a steadiness of gratitude in our lives with God, neighbor, and self? We will explore: gratitude abundant, gratitude grounded, gratitude wrestled, and gratitude begotten. Megan joined the ministry team of Seattle Mennonite Church as Lead Pastor in 2015, after a decade of pastoral ministry in Chicago. She is a graduate of Iliff School of Theology in Denver, CO and Goshen College before that, as well as an alum of the Intermenno Trainee Program in Germany and Switzerland. Somewhere in there, Megan made her home in Seattle for a few glorious years of exploring all that the city and surrounding gorgeous landscape have to offer. She is excited to be back in the Pacific Northwest and to have joined the exceptional SMC pastoral team. Reading and hiking are some of her favorite restorative activities. She also enjoys making baby quilts, going to concerts, frequenting the theatre to see her actor husband, Jon Stutzman, perform, and going on traveling adventures both large and small. Worship, fellowship & activities: Gather each morning for singing, prayer & reflection in group sessions. Then plan your own time…. Breathe in fresh mountain air; walk with a friend or enjoy the solitude. There will be opportunities to practice yoga & quiet space for those who crave time alone. Get creative with Open Studio in the craft room or join the knitting circle; participate in a book discussion* or catch up with friends, all while enjoying delicious meals and a bit of pampering. Take in the natural wonder of DCC’s beautiful surroundings: Breathe in the fresh mountain air. Walk with a friend or dedicate time alone for prayer and quiet meditation. Bring along a knitting project that you’ve been wanting to make time for… Don’t know how to knit and want to learn? Join a knitting circle and learn the basics or new techniques. There will also be a comforter to tie for MCC! Get moving! Space will be set aside for contemplative yoga. Open Studio… Take advantage of ample workspace, an abundant supply of paper, adhesives and assorted ephemera to express yourself in new and creative ways! Plan to arrive as early as 5pm, A light supper will be served and kept hot for guests arriving later. Morning worship will be followed by your choice of activities and free-time. An all-group activity will take place Saturday evening. Group study and worship followed by Glen’s delicious cinnamon rolls & brunch will conclude the weekend. 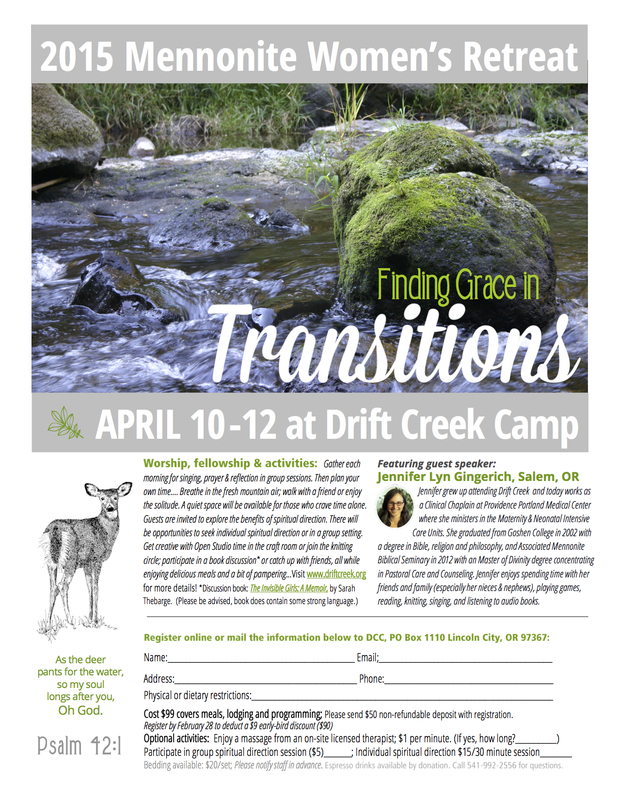 $99 Registration due by April 15. Marlene lives near the water in Port Townsend, Washington with her husband Stanley. 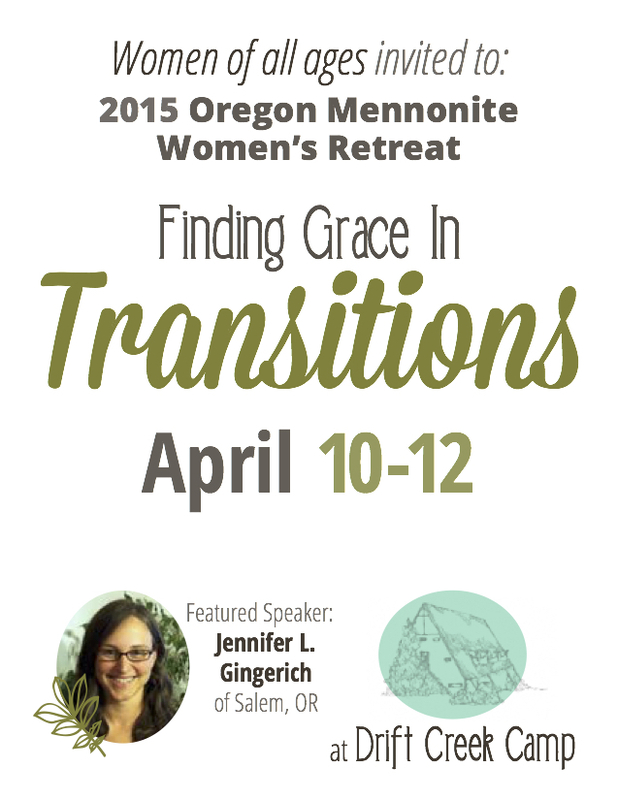 She is a spiritual director, retreat leader, ordained Mennonite minister, writer, and theologian. 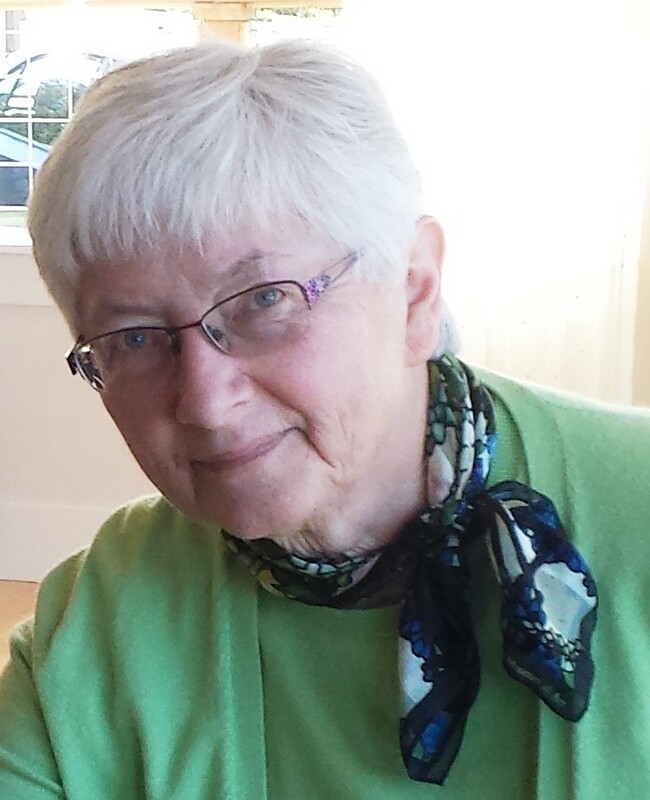 Marlene is retired from teaching at the Anabaptist Mennonite Seminary in Elkhart, Indiana, and from her role as Minister of Worship for Mennonite Church USA. Marlene and Stanley are parents of two adult children who live much too far away in Chicago and Pittsburgh. They enjoy sailing, singing in the community chorus and hosting guests. Worship, fellowship & activities: Gather each morning for singing, prayer & reflection in group sessions. Then plan your own time…. Breathe in the fresh mountain air; walk with a friend or enjoy the solitude. There will be opportunities to practice yoga, led by Linda Dalke. A quiet space will be available for those who crave time alone. Get creative with Open Studio time in the craft room or join the knitting circle; participate in a book discussion* or catch up with friends, all while enjoying delicious meals and a bit of pampering. Take in the natural wonder of DCC’s beautiful surroundings: Breathe in the fresh mountain air. Walk with a friend or dedicate time alone for prayer and quiet mediation. Bring along a knitting project that you’ve been wanting to make time for… Don’t know how to knit and want to learn? Join a knitting circle and learn the basics or new techniques. Get moving! Space will be set aside for movement and stretching. We hope the weather will cooperate for hiking! Spiritual Direction: A professional Spiritual Director will be available for individuals as well as in a group setting. Open Studio… Take advantage of ample work space, an abundant supply of paper, adhesives and assorted ephemera to express yourself in new and creative ways! There will also be an opportunity to create terrariums with Jaqui Eicher. and resourcing role for the Western District conference of MC USA in North Newton, Kansas for 25 years. She loves to be with people of all ages, tall trees and chocolate. She and her husband have two adult sons and an adorable grandson in Portland. Worship, fellowship & activities: Gather each morning for singing, prayer & reflection in group sessions. Then plan your own time…. Breathe in the fresh mountain air; walk with a friend or enjoy the solitude. A quiet space will be available for those who crave time alone. Get creative with Open Studio time in the craft room or join the knitting circle; participate in a book discussion* or catch up with friends, all while enjoying delicious meals and a bit of pampering. Explore the natural wonder of DCC’s beautiful surroundings: Breathe in the fresh mountain air. Walk with a friend or dedicate time alone for prayer and quiet mediation. Jennifer grew up attending Drift Creek as a camper. As a young adult she served on the summer camp staff and has given many volunteer hours over the years. Today she is a Clinical Chaplain at Providence Portland Medical Center in Portland, OR where she ministers in the Maternity and Neonatal Intensive Care Units. 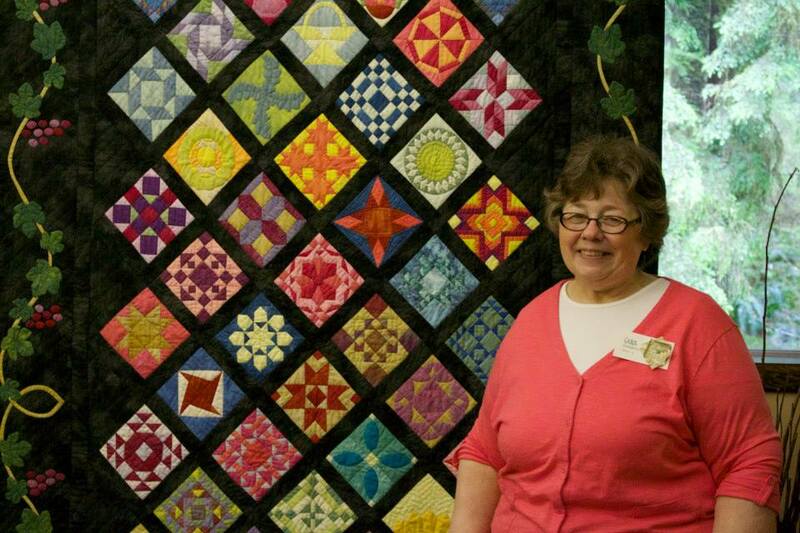 She is an active member at Salem (OR) Mennonite Church. 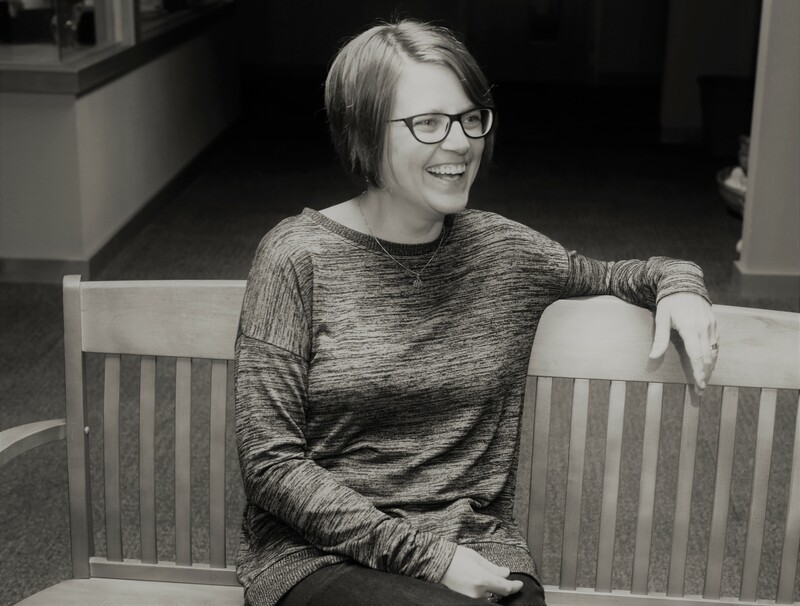 Jennifer graduated from Goshen College in 2002 with a degree in Bible, religion and philosophy, and Associated Mennonite Biblical Seminary in 2012 with a Master of Divinity degree concentrating in Pastoral Care and Counseling. She enjoys spending time with her friends and family (especially her nieces and nephews), playing games, reading, knitting, singing, and listening to audio books. Activities: Guests can choose to have an active weekend or to simply BE. Feel free to sleep in, sip on a cup of tea, dive into a book while warming by the fire, learn a new skill, spend time with your journal, chat with old friends or get to know new ones. Worship and Fellowship: Gather each morning for singing, prayer, reflection and sharing. A quiet space will be available for those who crave time alone. Guests are also invited to explore the benefits of spiritual direction. Spiritual direction is a means to enhance spiritual formation in the life of the believer. In the classic sense a spiritual director is one who, as a representative of the church, walks with another as a mentor or guide to facilitate that person’s relationship (formation) with God; it is a voluntary relationship between an individual wanting to enhance his or her spiritual growth and a mature Christian who is able to serve as mentor. Open Studio… Take advantage of ample work space, an abundant supply of paper, adhesives and assorted ephemera to express yourself in new and creative ways! Amidst the chaos of life’s constant demands, the benefit of self-care… Turn off the phone, let go of nagging responsibilities for a bit. 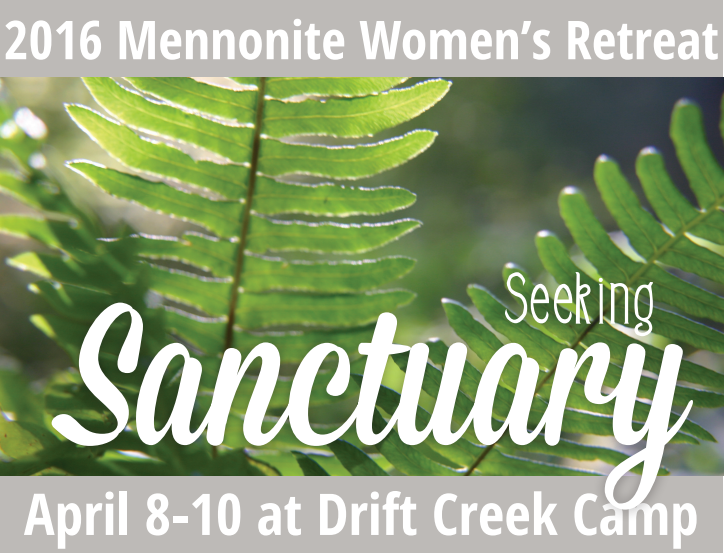 Invite a sister, a daughter, a mother, a friend… gather for music, worship and relaxation. Come, be renewed . Think of the weekend as a gift to yourself or to someone you love. Participants will find opportunities to grow in mind, body & spirit through group sessions, exploring DCC’s beautiful surroundings, taking time for meaningful conversations and pausing to be still and reflect. 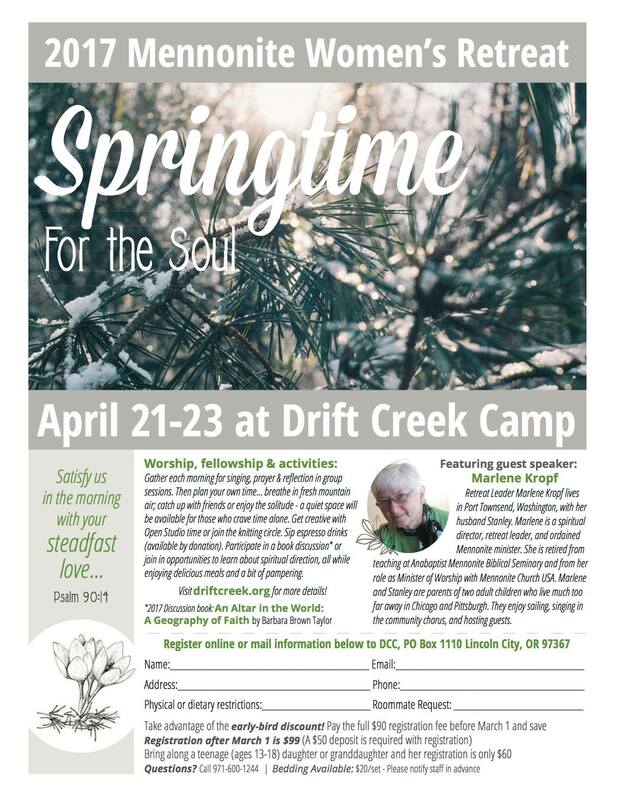 Delight in nourishing food, coffee treats and time set aside to connect with women of all ages, be quiet with God, and feed the spirit. You can choose how to spend your time so if a guilt-free nap is what you need, enjoy it! 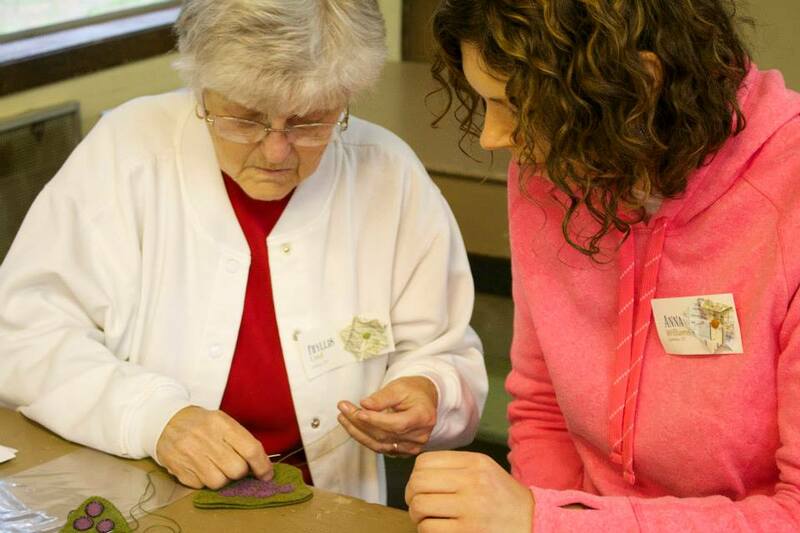 Group sessions led by artist & quilt designer, Carol Honderich. See this poster for more information. Consider the benefit of self-care in our fast-paced society. Turn off the phone, let go of nagging responsibilities for a bit. 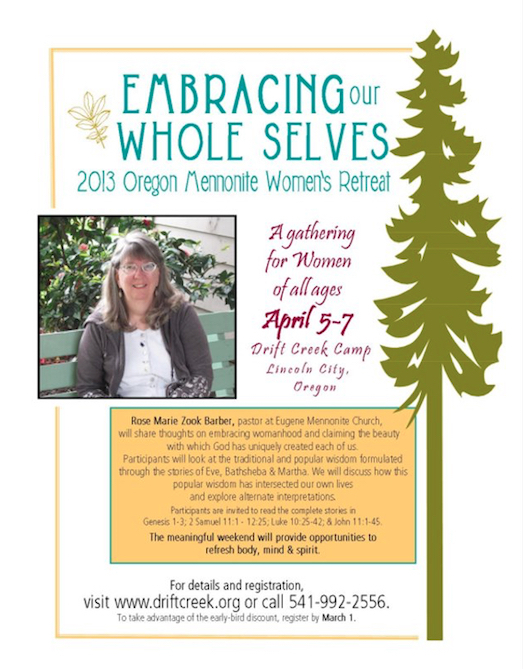 Invite a sister, a daughter, a mother, a friend… gather for music, worship and relaxation. Come, be renewed . Consider the weekend retreat as a gift to yourself or to someone you love. There will be opportunities to grow in mind, body & spirit through group sessions, nature hikes, meaningful conversations and times of reflection. Fun will be had as guests invite others to share in activities that bring them joy. 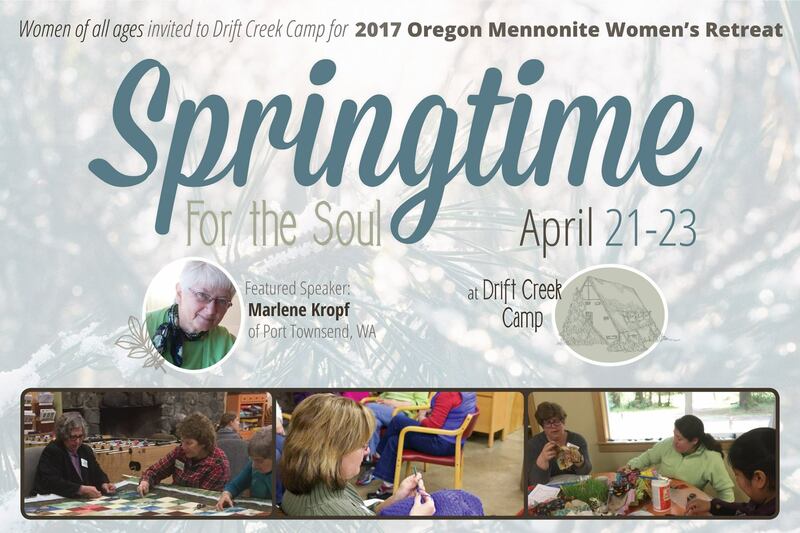 Delight in nourishing food, coffee treats and time set aside to connect with women of all ages, be quiet with God, and feed the spirit. Gather in community to tackle an issue we all struggle with: Perceptions of beauty! 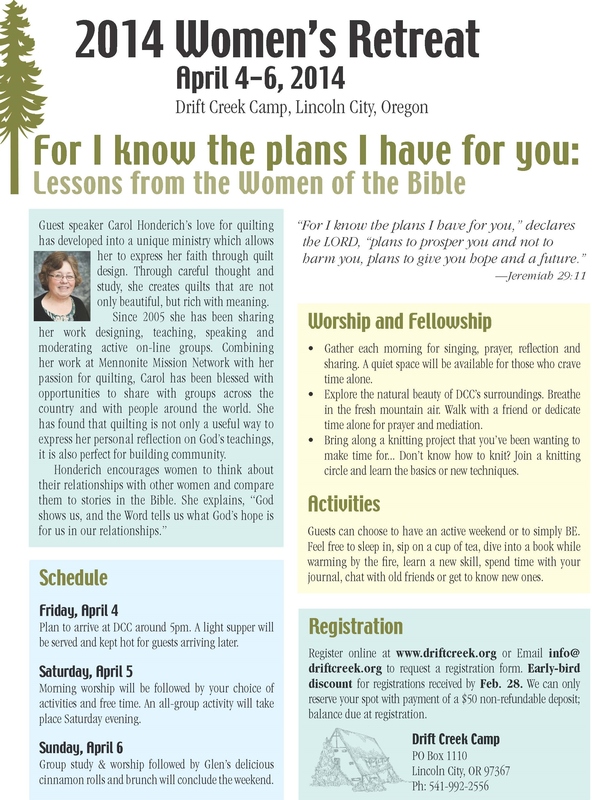 Join in as Rose Marie Zook Barber leads discussion times and explores the lives of Eve, Bathsheba and Martha. Explore the CALLANETICS EXERCISE METHOD with Cathie Jo! Callanetics are safe and non-impact, provide a balanced approach emphasizing stretching and neuromuscular coordination while also strengthening deep postural muscles. Callanetics provide deep muscle work – leaving you feeling stretched and relaxed! Bring a yoga mat! Knitting Circle (Beginners meet with Sara, 7:30pm, continue to knit at your leisure throughout the weekend! Gather in community to tackle an issue we all struggle with: the balance of time. 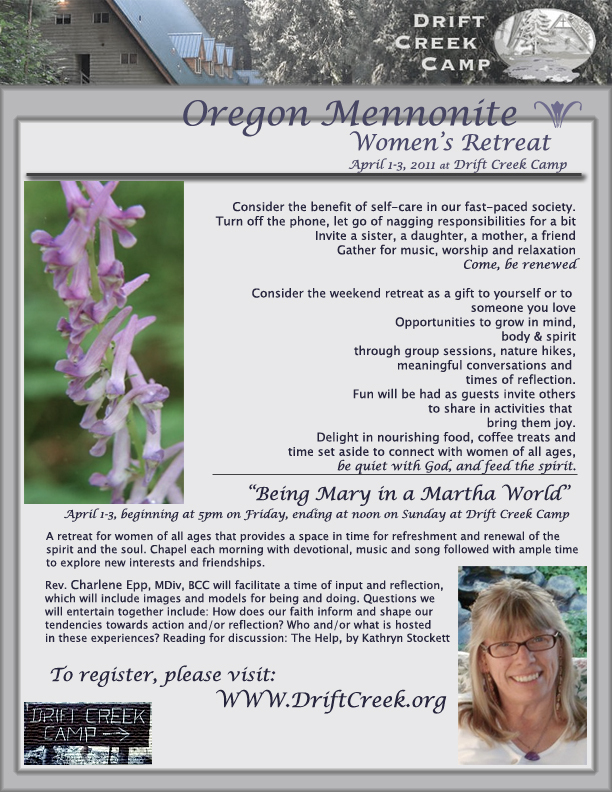 Join in as Charlene Epp leads discussion times and explores the lives of Mary and Martha and the way each woman chose to use her time. Charlene was born in SD, raised and baptized in the Northern District Conference of the Mennonite Church. Her family were farmers. She attended Freeman Jr. College in Freeman, SD and graduated from Bethel College, North Newton, KS with a BS in Elementary Education. She entered Mennonite Voluntary Service, living in Kansas City and Chicago during her service assignments as a teacher in several settings. It was in Chicago that she met Duncan Smith, also in MVS, and whom she married following the completion of their MVS terms. Two years later they relocated to Elkhart, IN for Duncan’s seminary training at the Associated Mennonite Biblical Seminaries (AMBS); towards the end of his schooling, she began seminary courses. They relocated to the Bronx, NY for Duncan’s first position as a solo pastor of a congregation: North Bronx Mennonite Church. She continued in the education field, serving as substitute teacher, then teaching in and coordinating gardening programs in The Family Garden at the New York Botanical Gardens. When Duncan’s mother’s health issues called them to follow through on their commitment to care for her, they relocated to Spokane, WA, moving into her home to care for her during the last 26 months of her life. 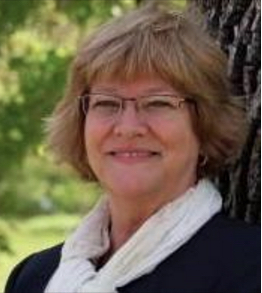 During this time, Charlene completed residency in Clinical Pastoral Education (CPE), a pre-requisite to being a Board Certified Chaplain (BCC) through the Association of Professional Chaplains (APC). She also continued seminary course work in stints back to AMBS. Following her mother-in-law’s death, they relocated again to Portland when Duncan accepted a position on the PNMC staff. Here she completed her seminary courses at Western Evangelical Seminary (now George Fox Seminary), volunteered as a chaplain at Inverness Correctional Facility and Providence Milwaukie Hospital until acquiring a full-time staff chaplain position in October of 2000 at Providence St. Vincent Medical Center, where she continues to minister today. She was ordained to Christian Ministry through PNMC, as a member of Portland Mennonite Church on July 14, 2002. Bring sleeping bag, pillow, flashlight, personal items, Bible, notebook, personal copies of Sing the Journey and Sing the Story if you have them, camera, your favorite game, fresh fruit for snacks and perhaps a talent or story to share for Saturday evening’s gathering around the fire. Book discussion— “The Help” by Kathryn Stockett Food demonstration — chocolate lava cakes! Table settings — We’re still looking for someone to teach this if you are interested? Saturday 8:00 Breakfast; 9:00 Chapel Morning interest Centers; 12:00 Lunch Afternoon Interest Centers 6:00 Dinner Evening Activity—Talent Show Bring along a talent, story, joke, skit song, game, etc. to share Saturday evening. Followed by evening prayers. 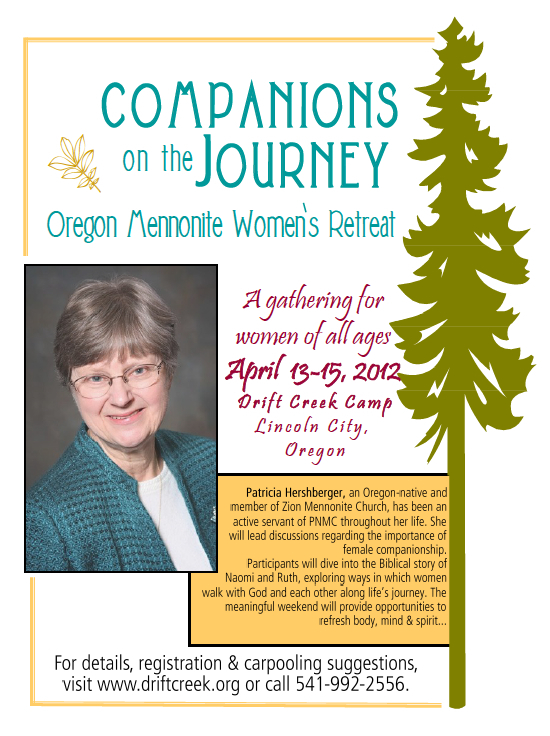 A retreat for women of all ages that provides a space in time for refreshment and renewal of the spirit and the soul. Chapel each morning with devotional, music and song followed with ample time to explore new interests and friendships. 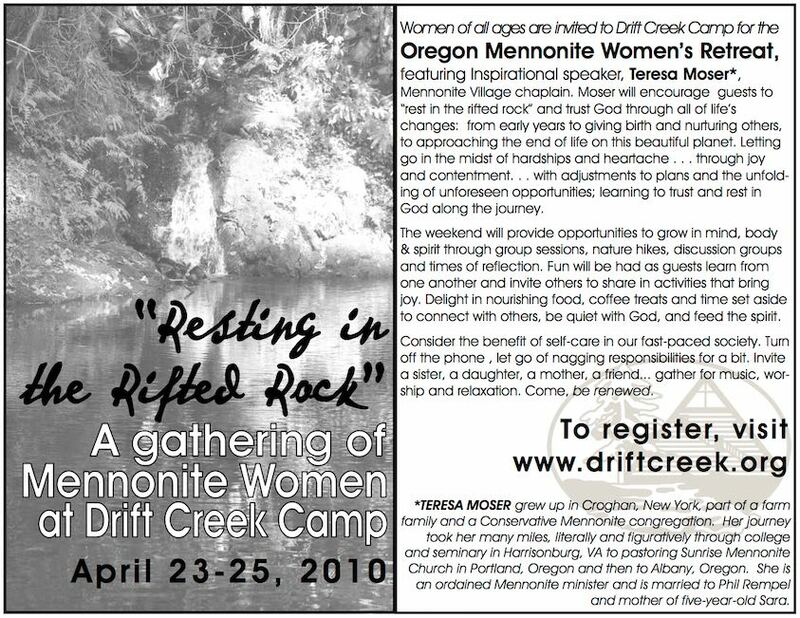 Mennonite Village chaplain, Teresa Moser, will encourage guests to “rest in the rifted rock” and trust God through life’s changes: from early years to giving birth and nurturing others, to approaching the end of life on this beautiful planet. Letting go in the midst of hardships and heartache . . . through joy and contentment. . . with adjustments to plans and the unfolding of unforeseen opportunities; learning to trust and rest in God along the journey. 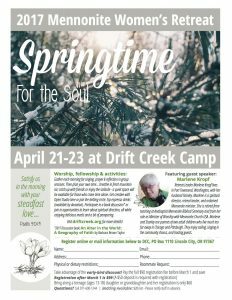 The weekend will provide opportunities to grow in mind, body & spirit through group sessions, nature hikes, discussion groups and times of reflection. Fun will be had as guests invite others to share in activities that bring them joy. Delight in nourishing food, coffee treats and time set aside to connect with others, be quiet with God, and feed the spirit. Consider the benefit of self-care in our fast-paced society. Turn off the phone , let go of nagging responsibilities for a bit. Invite a sister, a daughter, a mother, a friend… gather for music, worship and relaxation. Come, be renewed. Rose Burke will be on-site giving chair and table massages as well as parafin wax treatments to pamper your hands. The gift to yourself of massage is $1 per minute, hand treatments are $5. The book discussion group will feature Traveling Mercies by Anne Lamott . 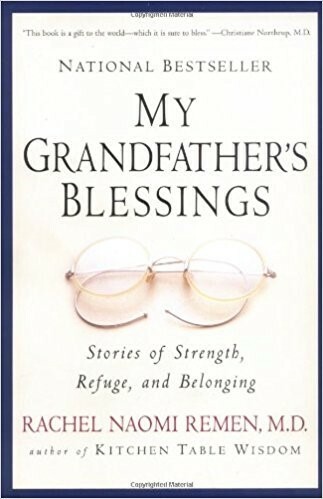 You are invited to pause after every chapter to reflect on your own life, reading it “in dialoge with yourself” as it were, examining your past and present with the same piercing honesty as Ms. Lamott has done. Where do you see God? What role does your faith community play in your life and decisions? Where do you feel alone? Let her brilliant sense of humor infect you and serve to lighten those places where your heart is heavy. Let her perceptiveness alert you to the gifts of your own ability to be acutely sensitive and perceptive to encounters and events in the world around you. Please bring along any journal or notes you make to share with the group. NOTE: Anne writes in an earthy, honest way, which includes language some may find offensive.